On May 13, 2010, Autogeek.net launched a campaign to support Operation Comfort, a non-profit organization devoted to providing rehabilitation services to wounded veterans of the operations in Iraq and Afghanistan. Autogeek customers can donate via Autogeek.net on the Operation Comfort page or in the shopping cart. 100% of the donations go directly to Operation Comfort. Just before Memorial Day we expanded our efforts by asking our vendors to contribute money or supplies, whatever they could, to help Operation Comfort and its Automotivation program. We are very thankful for the generosity of both our vendors and you, our customers. Learn more about Operation Comfort at Autogeek.net. * The winner will have the choice of three Lake Country 6.5 inch CCS Foam Pads. UPDATE! The final Operation Comfort Raffle winner is Ryan O. of Hermosa Beach, CA. Congratulations! Thank you to everyone who donated to Operation Comfort. You can donate any time at Autogeek.net. Any amount helps! Donate here! Memorial Day is coming up and you know what that means – a long weekend of detailing! Order now to be sure to receive your products in time for Memorial Day weekend. Spend just $95 and shipping is free to all military APO addresses and the entire United States, including Hawaii and Alaska, and Puerto Rico! You too, Canada! Spend Victoria Day detailing! Shipping is on us. 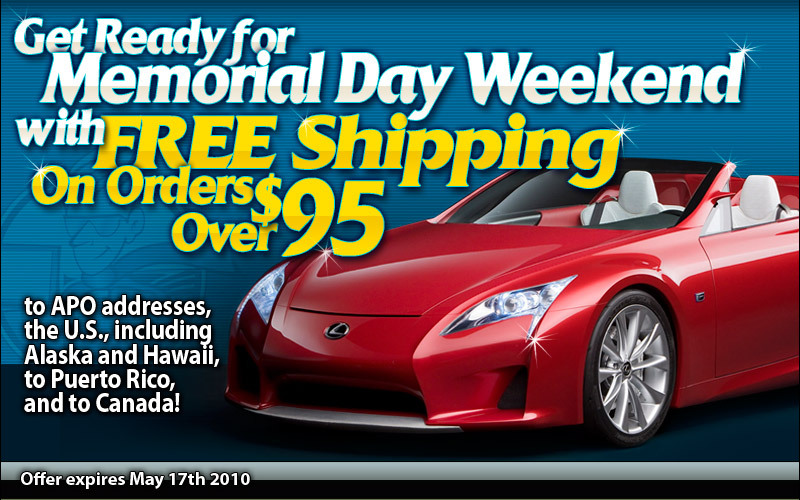 This is an unprecedented free shipping event! For the first time ever, we are able to offer free shipping outside of the contiguous United States. This is a great chance to choose from thousands of car care products and have them delivered for free! Don’t delay! This offer ends Monday, May 17, 2010. *All U.S. orders and Puerto Rico, please choose ground shipping. Canada orders, please select the Canada option. Expedited shipping excluded. Click for details. Save on all Flitz Products! Now on Autogeek.net, you can see the new video showcasing the incredible results of Flitz polishing products. Oley Jentzsch, president of Flitz Metal Polishes, visited Mike Phillips recently in the Show Car Garage to demonstrate how to restore the shine to oxidized aluminum mag wheels using Flitz. You can repeat this process on your own wheels using Flitz products, on sale at Autogeek.net through Monday, May 17, 2010! The DP Seal & Shine Kit includes our new DP Poli-Coat Paint Sealant, DP Xtreme Foam Formula Shampoo, and DP Final Gloss Quick Detailer at an incredible value! This kit is a perfect wash-and-wax kit for any vehicle. 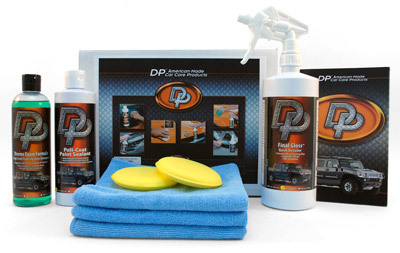 Use the DP Seal & Shine Kit on recently polished or newer condition vehicles to clean and protect the paint. DP Gloss Tire Gel – New Formula! DP Gloss Tire Gel is a long-lasting rubber dressing and protectant that gives tires a sleek, satin shine. The durable polymer formula contains powerful UV blockers and ozone protectants to keep tires, wheels wells, and rubber trim looking like new. Now available in 32 oz. DP Poli-Coat Paint Sealant preps and protects your vehicle in one simple step. A cutting edge, built-in bonding agent creates a longer lasting, more durable protective finish. The depth of gloss and rich color will turn heads regardless of color or type of paint. Autogeek.net is teaming up with the Speed Channel’s “Two Guys Garage” and “Truck U” to support Operation Comfort, an organization that provides support to wounded veterans of the operations in Iraq and Afghanistan who are being treated at Brooke Army Medical Center. Operation Comfort has been serving veterans since 2004 with programs designed to aid in recovery while providing some of the comforts of home. Projects include remodeling 11 waiting rooms at Brooke Army Medical Center for the families of wounded service members and a Tranquility room where the burn staff can take a quiet break during their work day. Operation Comfort also sponsors a softball league and participates in sled hockey, amputee surfing, river rafting, and adaptive Nordic and alpine skiing to assist veterans with their physical recovery. Financial assistance is provided for veterans and their families in need. Autogeek.net is pleased to participate in Operation Comfort’s AutoMotivation program, which gets veterans out of the barracks and onto a ranch outside San Antonio to work on cars. In conjunction with CarQuest, Autogeek.net is sponsoring Mike Phillips’ upcoming trip to San Antonio to teach wounded veterans paint correction skills that they can use to pursue a career in auto detailing. You can help Operation Comfort by making a donation in the amount of your choosing at Autogeek.net. Any amount helps. All money collected will go directly to Operation Comfort. If you would like to donate, select an amount from our Operation Comfort page and it will be added to your order. There will also be an opportunity at checkout to donate. Join us as we help Operation Comfort provide valuable recovery services to our wounded veterans. Visit OperationComfort.org to learn more about their work. Thanks to you, our loyal customers, Autogeek has expanded our space and our staff to provide better service and selection. Our 15,000 sq. ft. facility, finished just two years ago, was already overflowing with products and our office space was stretched to its limits! To accommodate current and future growth, Max has purchased an additional 5,000 sq. ft., which houses the Autogeek Show Car Garage classroom, testing center, and webcast/photo studio. Detail Fest guests got a personal tour of the addition and were part of the inaugural detailing classes taught in the new classroom. We’ve hired 12 new employees. New office space has just been added for our new administrative and customer service staff. Now when you call or email Autogeek, we have more customer service representatives to assist you with placing an order or answering your questions. In the warehouse, eight new employees have been added to our order fulfillment team. By expanding our staff, we will continue to fill your orders quickly and accurately. Visit our About Us page to see an interactive map of the entire Autogeek/PBMA headquarters and pictures of our staff. As Autogeek grows, so does our commitment to our customers. After all, your support has created this success. As we expand, your experience should only get better. If you need assistance with an order, a product, or car care advice, our team is here to help. Contact us toll free at 1-800-869-3011, by email or via Live Support. As always, thank you for choosing Autogeek.net for all your car care needs!